Novelist William Peter Blatty based his best-seller on the last known Catholic-sanctioned exorcism in the United States. Blatty transformed the little boy in the 1949 incident into a little girl named Regan, played by 14-year-old Linda Blair. Suddenly prone to fits and bizarre behavior, Regan proves quite a handful for her actress-mother, Chris MacNeil (played by Ellen Burstyn, although Blatty reportedly based the character on his next-door neighbor Shirley MacLaine). 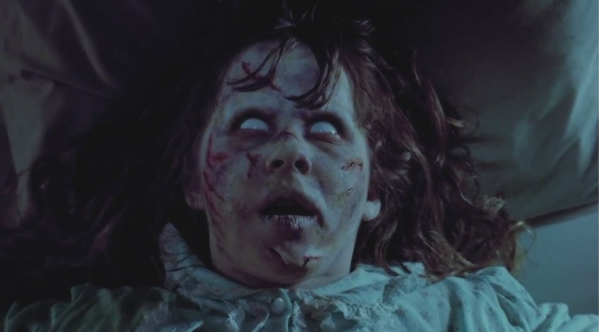 When Regan gets completely out of hand, Chris calls in young priest Father Karras (Jason Miller), who becomes convinced that the girl is possessed by the Devil and that they must call in an exorcist: namely, Father Merrin (Max von Sydow). His foe proves to be no run-of-the-mill demon, and both the priest and the girl suffer numerous horrors during their struggles. The movie shows once only, on Thursday, October 10 at 7 p.m. Cerrito Classics are popular: it’s always a good idea to buy your tickets in advance, at the box office or online. Plan to arrive early, to select your seats and to order beer or wine and delicious, freshly-made food. Don’t forget to check out The Scene. It’s a stylish place to meet before or after the show, or any evening at all. Opens daily at 5:00 and has its own special menu of appetizers, sandwiches, salads and desserts, plus a great wine list. Mr. Shadi actually began his display in a vacant lot next to his house on the Arlington. It was only after he passed that his display appeared at the PG&E right-of-way at Schmidt and Moeser. Our apologies for the mis-information.